post asked the artist and critic Luis Camnitzer, one of the project directors of Global Conceptualism: Points of Origin, 1950s–1980s, to respond to some basic questions about the exhibition. In this interview he talks about how the show evolved. He also addresses how the organizers dealt with critical issues such as the differences between “Conceptual Art” and “Conceptualism” and the always-blurry frontier between art and politics. 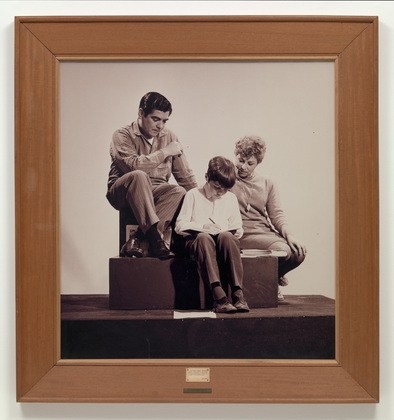 La Familia Obrera (The Working Class Family), Oscar Bony, 1968, Gelatin silver print, Gift from the Latin American and Caribbean Fund, MoMA Collection. 1. How did you get involved in the exhibition? I was writing something about the blurry borderline between art and politics, particularly in regard to the Argentinean “Tucumán Arde” group, which in 1968 shifted from art to politics, and the Tupamaro guerrilla movement in Uruguay, which from the early sixties on staged creative and spectacular events that had an aesthetic surplus way beyond military efficiency. Both examples show that the traditional restrictive categories had stopped being operative. The text was prompted by the exhibition The Bride of the Sun, which Catherine de Zegher co-curated at the Royal Museum of Fine Arts Antwerp in 1991. The writing eventually ended up in a book, but in discussing it with Jane Farver and Rachel Weiss, it also inspired the show. Jane, Rachel, and I were close friends and had worked together on other projects. Jane, at the time, was the chief curator at the Queens Museum, and Rachel had been involved in the organization of several shows (among them the landmark Ante America, also at the Queens Museum). In that context, I was the least professional—not to mention kind of a slacker. Since we wouldn’t receive funding for a Latin American exhibition, we decided to make the exhibition global; and since we wouldn’t receive funding for an exhibition focused on politics, particularly one in which the politics of the U.S. might be questioned, we decided to focus more on art practice. One important guiding point for the project was Jane’s suggestion to use 1968 as a flexible time paradigm. In writing for the catalogue of a Korean exhibition at the Queens Museum, she had compared the 1980 Kwangju Rebellion to the Paris riots in May 1968. This is what made us think of writing history based on local timelines instead of a hegemonic one. We conceived of the exhibition as a decentered federation of localities, each addressing its own crisis within its own corresponding timeline. Although there was information leakage among these localities, the noxious imperial concept of derivativeness lost its usual importance. The traditional hegemonic 1965–75 time frame for Conceptual Art was revealed as being self-interested and exclusionary, and designed to promote a local Euro–North American formalist style (any earlier manifestation was called “proto-conceptual” and anything after, “post-conceptual”). By bringing in Gutai and Situationism of the late fifties, together with Chinese art from the late eighties, we broke with narrow classifications. All this led us to assemble a team of eleven curators to cover a maximum of regions. The title Global Conceptualism came about later, after the show was more or less organized. It did not try to promote the idea of one “global art,” but rather the global scope of localities in geographic terms, with the intention of getting rid of any centric arrogance. 2. How did you approach the label “Conceptualism”? Peter Wollen, who was in charge of the North American section, made a big point about the difference between Sol LeWitt’s and Joseph Kosuth’s visions of Conceptual Art. This led us to differentiate between “Conceptual Art” and “Conceptualism.” “Conceptual Art” became the term that covered the stylistic period in the U.S. and to some extent Europe between 1965 and 1975; “Conceptualism” referred to a set of strategies that emerged in periods of crisis and rupture, and it favored the transmission of ideas over any formal speculation about or search for a mystical essence of art after dematerialization. This difference was important. It put Conceptual Art into a broader and more meaningful context in which seeing was one of many manifestations. It revealed that radical expressions were better seen in communication than in formal changes. And it showed that Conceptualism, in being a strategy, was not bound to the time cycles proposed by traditional art history. While Conceptual Art continues the tradition of contemplative art, Conceptualism more directly addresses the issues of erosion of information during transmission, the efficiency of communication, and the flexibility needed when time isn’t owned by either the artist or the viewer, when instead it has to be recovered from the repressive structures that usurp its ownership. 3. Would you have done anything differently? If I were to redo the exhibition (and to get funding without strings attached), I would probably go back to one of our initial ideas, which was to present works of art mingled formally and indistinguishably with documentary material in such a way that art and politics are not seen as the results of different disciplines, but rather as cultural consequences affected by political conditions. I would emphasize the ownership and control of time to study the effects it has on all of our activities—both subversive ones and those that aim to maintain a status quo. These changes would inevitably make for a different exhibition today, and so, fortunately, I’m not a curator. Looking back, it was fantastic that the exhibition took place at the Queens Museum, which is an institution on the periphery, yet as close to the center as any “periphery” could be. How threatening that can be was reflected in the bad reviews the exhibition received from the local press, confirming our point that the center is just another province. What we did lack, however, was space. We were unable to show everybody we would have wanted to show or should have shown. The real show would have needed to be twice as big and in a larger space—someplace like the Pompidou. As it was, we were limited to certain examples that had to stand as such and to serve as much as references to other works as works in and of themselves. So, it was a microscopic version of what we wanted. And yet, although I did much less than Jane and Rachel, I ended up exhausted and would not want to go through the process again. Rachel Weiss, curator, writer and professor at the School of the Art Institute of Chicago, was invited to MoMA to speak about the exhibition Global Conceptualism: Points of Origin, 1950s–1980s, which she co-organized in 1999 with Jane Farver (who also came to talk on the subject), Luis Camnitzer, and an international team of curators: Okwei Enwezor, Reiko Tomii & Chiba Shigeo, Claude Gintz, László Beke, Mari Carmen Ramírez, Peter Wollen, Terry Smith, Margarita Tupitsyn, Sun Wan-Kyung, Gao Minglu and Apinan Poshyananda. Weiss and Farver (whose talk can be accessed here) were asked to reflect on the exhibition—its challenges, failures and successes—fifteen years after it was seen at the Queens Museum in New York. I think the most basic issue that we dealt with in organizing Global Conceptualism is one that hasn’t changed much in the years since—how to reconcile the process of exhibition-making with the messy assembly that any project with global reach necessarily entails. Curating usually has a premise of connectedness—series, progressions, resonances, echoes—meaning that an exhibition narrates something and adds up to something. It’s about asserting why things should be seen together. But curating globally—at least the way we experienced it—meant accepting a very different kind of aggregate. This was exacerbated, more then than today, probably, by the fact that there’s a natural tendency to read something unfamiliar in terms of its likeness to something known: so our primary task was to present a lot of unfamiliar work as much as possible on its own terms, rather than as a corollary to the conceptualist history that was already well established. Our basic starting point was the sense that Conceptualism had been an extremely supple cultural tool, able to contend with the volatile social and political circumstances that existed in many parts of the world in the postwar period. Therefore what we wanted to do with the exhibition was look at a broad array of places and moments in order to see how art had answered those circumstances. The show argued that there were many different modernities in all those different places, and that Conceptualism arose variously across those locales and from those modernities. Underlying all of this was an intuition about the particular suited-ness of Conceptualist practice to undertake such ambitious tasks. We suspected that this came from Conceptualism’s interest not only in ideas, as is often claimed, but in their transmission. Ideas in themselves could be just another version of the object of art, even if a dematerialized one: but ideas in motion immediately pushed to the fore questions about who receives them, and what happens as a result. However, those ideas—especially their transmission and the people to whom they were conveyed—were very different from one place to another, dependent on obvious factors like cultural and political histories but equally on the facts of infrastructure (communications technologies, for instance, or means of travel and transport—something as basic as air routes—or information sources and channels) and so even the one connective tissue in the project—namely, the idea of Conceptualism—had to be an extremely accommodating container. There was no unanimity on how the word was used, if it was even used at all: it sat differently in relation to artistic and aesthetic precedent and in relation to the “mainstream” (in some cases artists were eager for affiliation, in some cases they were adamantly opposed to it, and in others they were indifferent to the whole question). This was no less complicated a landscape than the one in which we ask questions about art overall; in a global context are we on any kind of solid ground if we assume that the term carries enough intrinsic meaning to make “art” comprehensible as art, no matter the context? We had an intuition about Conceptualism, and we had another one about what it might look or feel like if so many different and often-unconnected strands of artistic activity were brought together, but I think that was about all that we had any solid sense of when we decided to do the show. We started out with a pretty basic premise—we could call it anti-colonialism 101, rejecting the geographical limitations of how Conceptual art was usually mapped. As we got further into it we shifted into a more postcolonial position, no longer centrally focused on simple dynamics of exclusion and more interested in difference. This happened basically because the works that the curatorial team were bringing to us didn’t fit any unitary definition. For instance, we had begun with an assumption that Conceptualism, as a protagonistic force, did its most important work in public space, retaking control there against the repression of military rules, etcetera. But it became clear very quickly that our understandings of public and private space—derived almost entirely from experiences in the US and Latin America—didn’t hold for lots of other places. We knew about apartment art in Moscow, but we also knew about the bulldozer show,1 and so when I was doing preliminary research in Prague and Budapest, one question I asked a lot was about works in public space. I quickly realized that the question was irrelevant for most of the artists I was talking to since they had viewed public space as totally coopted and corrupted, and for them the space of dissent had been private and hermetic.2 So gradually our position as the conceptualizers of the project became less about the map and more attuned to particularities. 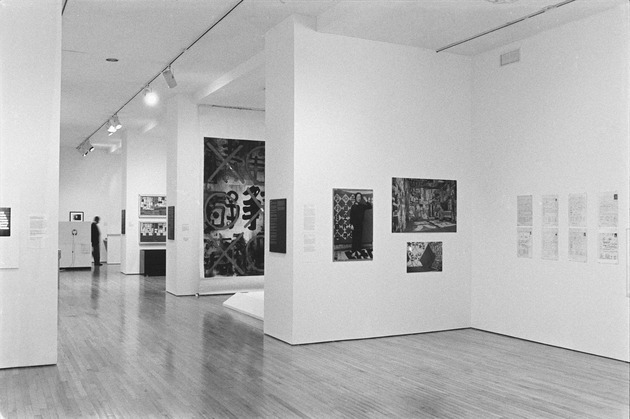 Installation view of the Global Conceptualism exhibition with works by Antonio Dias, Hélio Oiticica, and Oscar Bony, Queens Museum, 1999. This brings me to the question about the structure of the curatorial team. The horizontality of the team—an approach that was then taken up in some other big international shows in the next years—was a completely obvious choice for us. We did it that way for a couple of reasons. First, the three of us felt that it was basic to the ethic of the show and the whole idea of the project that there should not be a strong centralized narrative. If our goal was to look at how Conceptualism worked in all those places, then we had to allow each narrative to take its own shape. We saw our role as, first of all, convening, then looking for the threads that developed between the various sections—looking after the emerging shape of the whole. But it was always clear that the show would be a loose confederation rather than a unified body. The other reason for the collaborative curatorial structure was simply that the three of us had no expertise in a lot of the ground we wanted to cover, and it was obvious that others were much better suited to the job. So the structure of the team was our way of building an exhibition that did not, in its form, betray its political commitments. The decision we made to install the show by geographic section rather than thematically was a related structural/philosophical issue. It boiled down to the same question: was our point to assert that conceptualism grew into a shared language, or that it was the specificities in how it arose and played out that mattered most to us? Because so many of those “local” histories were still basically unknown—both in NY and even in their home sites—it would have been premature to install the show according to thematic or topical affinities, which inevitably would have reinforced the dominance of the work that was already known, with all the new material being consigned to some kind of offshoot status. It’s worth talking a little about the word “global” here. We debated a lot about using it because, if I remember correctly, at the time globalization was being talked about as a process that produced ubiquitous sameness when, in fact—and especially in the cultural sphere—that sameness was real only on the most superficial levels. The alternative would have been “international,” but that word was still too weighted down with colonial and imperialist connotations—for example, as in “international style.” Both terms seemed to indicate a kind of geographical flattening that was the opposite of what Global Conceptualism was meant to be about. We wanted to signal a different kind of relation, which was neither made up of vectors all pointing from the same few places out to all the other places, nor fatally relativist—and although we were uncomfortable with its implications of comprehensive coverage, “global” seemed the better compromise. It might be useful at this point to reflect on some of the projects that have taken up from where we left off, to see how they’ve pushed further and begun to work out some of the cans of worms that we left open. Those challenges are—to list the most important ones—how to go beyond simply expanding the map, to work through what it actually means to have all those different models on the table and accept that they don’t fit together neatly but that they still do belong together; to look at the interconnections—both interpersonal and temporal—among the various artists and works and moments; and finally, how to deal with the inevitable canonization effect when fresh bodies of work enter the international, not global, exhibition system. The first issue, namely, of curating all that difference, turns out to be a challenge to the idea of an exhibition, at least of an exhibition as an essay or a thesis. It also suggests a more fragmented kind of expertise and authority on the part of the curator. The second, about linkages, begins to create a more dynamic mandate for the exhibition, as opposed to the more static portrait that we were able to construct. And the third one suggests a need for a further iteration of institutional critique, in which the trajectories or life cycles of works and histories themselves become more transparent. I’ll try to address these three questions by looking at a few shows that I’m aware of, which start from a premise related to our own. These go in two different directions— exhibitions interested in sketching a ‘global’ picture, and ones committed to re-reading recent art histories—and, especially, conceptualist ones— in the name of rescuing neglected but crucial legacies. Of the former, the general approach seems to be—as it was for us—to define “a globalism which acknowledges global links, but insists on the differences among movements ‘spurred by local conditions and histories.’”4 And with regard to the latter, these are projects that arise from an urgent sense of loss, and of the need to recover, reclaim, or reactivate histories that have been systematically lost or hidden. Not surprisingly, those projects have cropped up in places still very much impacted by the societal traumas of the second half of the 20th century—dictatorships, malignant state socialisms, totalitarian regimes, the forced amnesias of neoliberalism in Latin America, and so on. 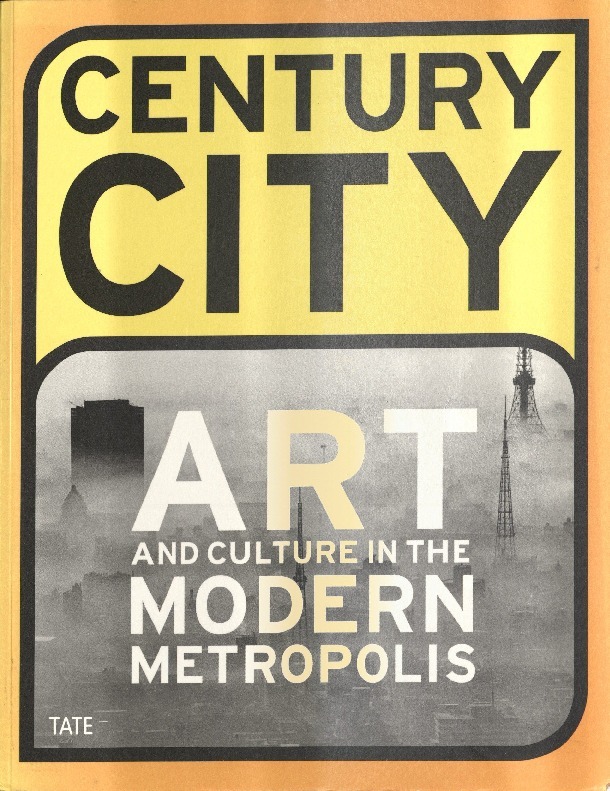 Century City, at the Tate [Modern] in 2001, argued for the centrality of cities in the emergence of modernity, and therefore selected nine cities in Africa, Asia, the Americas, and Europe that have “acted as crucibles for cultural innovation.”5 Each of the sections of the exhibition focused on “flashpoints generated by artists and other cultural practitioners.”6 Century City’s curatorial structure was like what we used in Global Conceptualism, framing each city as the site of “one of many modernisms” and assigning each to a curator who could work from firsthand knowledge of it. Because they were looking at cities rather than art movements, I think they had a more aerated platform, which in turn made it possible to move more easily among a lot of different kinds of cultural production—artworks, sure, but also posters, books, photojournalism and documentary, and so on. It seemed to me at the time that that kind of flexibility gave a less preconditioned kind of space for looking at global complexity and particularity. 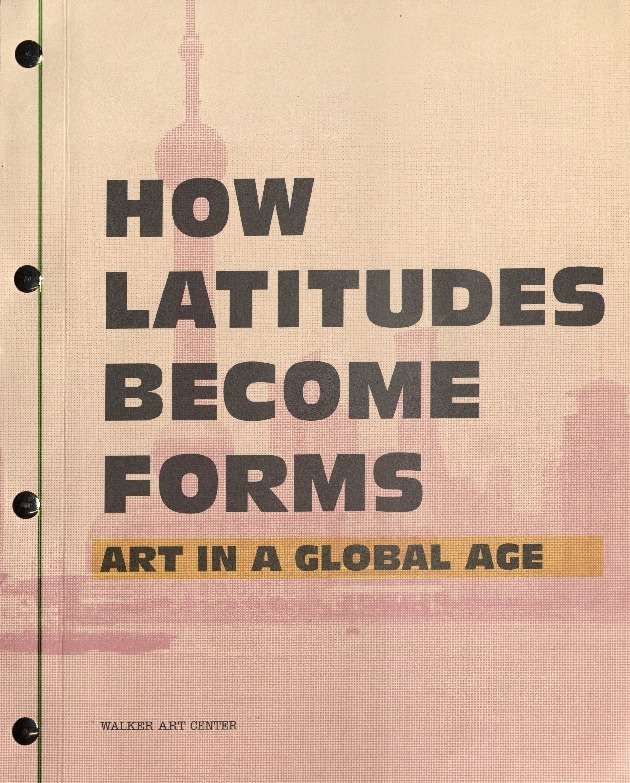 There also seems to be a connection to the Walker Art Center’s 2003 How Latitudes Become Forms, which was a kind of remix bringing together Szeemann’s “Attitudes” with Global Conceptualism’s approach to latitudes. The central trope in that show was what Philippe Vergne called “the reinvention of difference,” taking up Saskia Sassen’s idea that the world of so-called global cities is one in which the shape of the world economy and the influence of new communications technologies have “not only reconfigured centrality and its spatial correlates, but have also created new spaces for centrality.”7 So what we shared in this case was a core interest in developing a different kind of map—not just a more expansive one, but one in which the parts related to the whole in a different way— in order to understand artistic production. I didn’t actually see Latitudes, so I’m working off the catalogue here, but there were a few things that seem worth noting. First, the language around global differences and political baselines felt a lot more confident—like these were no longer nearly such contentious things to claim as they had been a few years before. And like Century City, Latitudes looked much more broadly across genres than we ever did, incorporating film, performance and online works to, again, sketch difference across multiple dimensions and expressive orbits. In both cases, it seems that curating happened in a kind of constellation—something that has become much more common since then—in which there were relatively distinct areas of expertise that were applied to relatively distinct areas of the exhibitions—even to the point that there weren’t extensive primary essays in either catalogue. The other direction I mentioned is that of shows that have set out to build counter-narratives that recapture lost art histories. Okwui Enwezor’s 2001 project The Short Century: Independence and Liberation Movements in Africa 1945–1994 is key here, bringing a little-known “local” history to light—that of Africa—and situating it very pointedly in relation to dominant accounts. Eric Hobsbawm’s book The Age of Extremes was a key text for us. Hobsbawm reads the global history of what he called the “short century” with an eye to the cultural dimensions of the massive political and economic upheavals that it saw. Okwui’s show adopted a similar methodology, using the format of an exhibition to narrate a broadly cultural history of African liberation movements in the second half of the 20th century. In The Short Century, he developed the arguments he had sketched in Global Conceptualism, exploring different forms of African modernity, contesting the claim that it was simply a variant of Western (and colonial) modernity. He also tied those modernities intimately to the independence and liberation struggles, and the revolts of that period, identifying them as the “twin projects from which the text of African modernity after WWII was fashioned” and which contributed to “an African critical subjectivity that is both a political ethic and a cultural ideology.” The heterogeneity of material that he included in the exhibition mirrored his larger point about the complexity of African modernity and also asserted linkages between aesthetic, ideological, political, and other sectors. 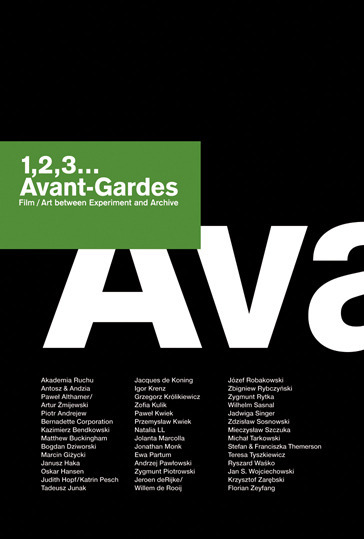 From 2006 to 2008, Florian Zeyfang and Lukasz Ronduda’s 1, 2, 3…Avant gardes project was shown in different iterations in Warsaw, Stuttgart and Bilbao. It looked at experimental Polish films and their influence on different generations since the 1920s and was spurred by the curators’ belief that those works, which had been the subject of bannings and prohibitions and were mostly unknown because of that, could form an important historical platform for a lot of the work that they saw being produced in Poland more recently. This, incidentally, seems to me one of the richest parts of their curatorial project, since it was so committed to putting historical works into dialogue with the present while preventing the inadvertent canonization of those historical works—by “canonization,” I mean their de-activation by prematurely settling on a definitive interpretation. I’ll say a little more about this issue of canonization in a moment. So that was one way they pushed the question further. Another was by looking closely at interactions and networks among artists—which they structured in such a way as to illuminate “local references in an international network of ongoing cooperation.”8 This was something we had struggled with: how to present the various links among artists as a way to contextualize their work beyond the simple fact of national or regional origin. We were interested in the many anomalies that we came across—for instance, the fact that Petr Stembera and others working in Prague were in close communication with Chris Burden in California but were hardly connected at all to their counterparts working underground in Budapest or Warsaw. That was an aspect of “globalism” that proved really difficult to translate into an exhibition format, since it was much more of a hypertext than a text. One aspect of “Vivid Radical Memory” that seems really important to me was the fact that curators, researchers and artists from different generations participated—some who had been active in the ’60s and then a lot of young scholars. It was pretty evident in the dynamic at the VRM meeting that the histories being reclaimed functioned differently for different parts of the delegations. For the “historical participants,” there was a heavy dose of vindication attached to the occasion, while for the younger contingent the project felt much more forward-directed, allowing for more open-ended thinking about what those pasts might have to offer to the present. “Vivid Radical Memory” and Subversive Practices traced their genealogies through a line of efforts to broaden the historiography of Conceptual art. Those efforts mattered to them because they saw in them a strand of dissent that was little known and which provided an important alternative to the classic profile of “the dissident” that had been constructed in the West and internalized in the East. In that sense, their most important contribution is probably the archiving function that both put at the center of their projects. Much of the documentation of the works they studied had been lost, or was in precarious condition, or was forgotten in individual artists’ archives. And meanwhile, after 1989 the growing interest among institutions from the West in procuring some of those works had begun a process of transfer of whatever archival materials there were into the hands of those institutions and therefore out of reach for researchers in those regions. So, both projects expended a lot of effort to “exhume” archival holdings, conserve and stabilize and digitize them—even reconstructing some works that had been lost. The repercussions of Global Conceptualism that I’ve been most aware of are in Latin America, where there has been a succession of projects which have built on each other. 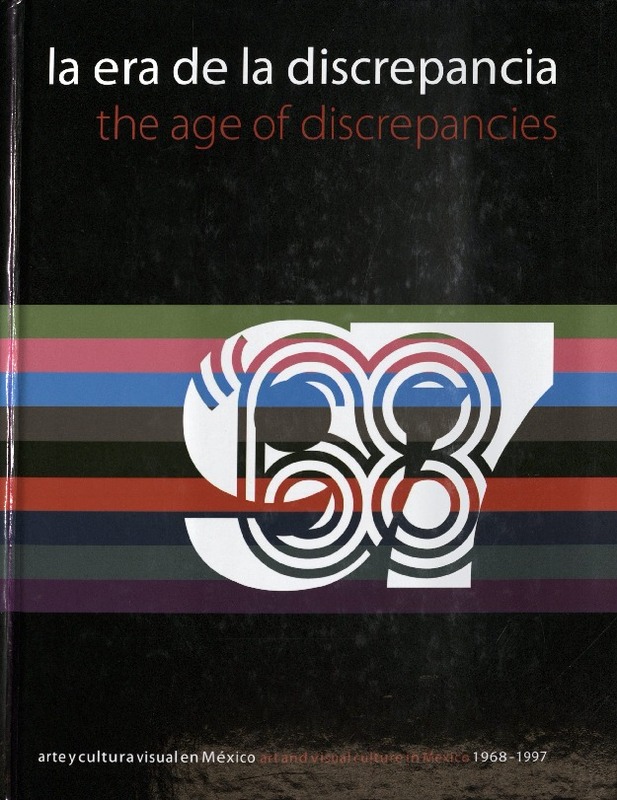 This line began with _La era de la discrepancia: arte y cultura visual en México 1968–1997 The Age of Discrepancies: Art and Visual Culture in Mexico 1968–1997, organized by Cuauhtémoc Medina and Olivier Debroise in 2007. The period covered in the show began with the massacre of student protestors at Tlatelolco, just before the Mexico City Olympics. The curators chose that as their starting point because, as they saw it, 1968 inaugurated a period of greatly increased cultural repression and much more intense resistance to it on the part of artists. The show ended with the Zapatista uprising, which, as the curators put it, “proposed a creative form of ethnic resistance to global capitalism.”11 But unlike 1968, 1994 didn’t have immediate ripple effects on cultural production. That took a couple of years, so the show’s purview extended to 1997, when the “cultural outcome of the crisis of 1994”12 had become visible. So the bookends were periods of heightened creative dissent, moments with historic implications for Mexico. Like the other shows I’ve mentioned, The Age of Discrepancies was a project of recovery, insisting on the importance of a lost national history of art—a project made even more necessary in that moment, the curators argued, because of the insertion of Mexican artists into globalized circuits. In their words, it was “a renegotiation of peripheral genealogies,”13 by which they meant both internal and external “peripheralization,” since the works they were interested in had been sidelined first of all by the heavy-handed nationalist writ of Mexican state cultural policy. Their goal was to effectively counter what they called the “reigning ignorance of local cultural histories,”14 reflected in the absence of important local artists from even local museums and collections. As I mentioned, the curatorial team of The Age of Discrepancies did extensive archival work, locating and rescuing artists’ archives. After extensive debate, they also decided to reconstruct key works that had been destroyed. The overall idea of the project was that it should serve as a broad platform, assembling and making accessible an archive of documents, images, and videotaped interviews, for use by future artists/scholars. It’s worth noting that this project, alone among the ones I’ll mention, was organized under the aegis of a university, so it was able to take on a much more expansive educational role than any of the others. As with Global Conceptualism, the curators of The Age of Discrepancies looked at “political, aesthetic and ideological dissent” as a unified field, thereby closely tying Mexican Conceptualism to leftist politics, especially in the aftermath of 1968. The history of independent groups was a central axis of the show, featuring the mechanisms of production and distribution that had been invented by the artists themselves. This meant that they paid a lot more attention to networks among artists—including both national and international collaborations—adding to the complexity of the argument they were making about that period of “Mexican” production. It’s also worth noting that Mexico barely figured in Global Conceptualism, and that The Age of Discrepancies was partly a retort to that exclusion from our own supposedly inclusive project. The other large-scale project about Latin American Conceptualism I should mention is Perder la forma humana: una imágen sísmica de los años ochenta en América Latina, organized by the Network of Southern Conceptualisms for the Museo Reina Sofia in October 2013. The network is a self-organized collective of around 25 researchers spread across South America and Mexico. They’ve been in existence for several years, having grown out of the Vivid Radical Memory project in Barcelona, but this was their first major exhibition. Perder la forma humana was not about Conceptualism per se, but rather about responses—mostly artistic, but not entirely—to the military dictatorships, states of siege and internal wars throughout South America during the 1980s. The title references the fact that the recourse to the body was a primary artistic and political support. They started with the 1973 coup against Allende in Chile, which inaugurated an era of genocidal politics that reached across the continent and brought to a brutal close an era of revolutionary hopes and expectations. The end point was—as with The Age of Discrepancies—the 1994 Zapatista uprising, which marked the opening of a new era of mobilizations and activisms on a global level. Again, these were histories that had been suppressed or badly distorted over time: it was significant that many of the researchers on the team were actually the children of people who had lived firsthand the realities of that brutal period that they were recovering. The show made a couple of main arguments—first of all, about the centrality of the new kinds of self-organized congregations, assemblies, affinity groups, collaborations, and so on that emerged at the time in response to the closure and militarization of public space. They also contended that, in the face of rampant, state-sponsored violence, those artists devised new ways of doing politics, with much of the project of devising new subjectivities taking shape around some form of an unruly self, What interested them were the ways that work in the 1980s, unlike earlier periods of artistic resistance, had rejected the traditional structures and discipline—both ideological and aesthetic—of left-wing politics in order to develop a more expansive, affective, and polyglot aesthetic register. I think that Perder la forma humana solved a couple of important problems that had plagued Global Conceptualism. First of all, and like some of the other shows I’ve talked about so far, they were not so exclusively attached to the idea of art, such that everything in the exhibition had to be defensible in those terms. They were more interested in the experiences that those societies had had, and how people had responded. Art was important to them as a way in which people fought back, but it was not the only way they were interested in—and hence their inclusion of Paraguayan arete guasu ritual masks, which have been continually updated for centuries by Guaraní Indians to reenact the various depredations, since the conquest, that the tribe has endured, resisted and survived. The show also included the work of a Chilean photojournalism collective, which provided an important, alternate source of information about the realities of the Pinochet regime. So the universe they sketched in the show was one in which the artists were not separated out from the very broad coalitions that were actively strategizing ways to resist. In fact, one of the most interesting points in the show was the disagreement between artists and the Madres de la Plaza de Mayo over the visual strategy of the siluetas—which set out pretty clearly the sharp political difference between visualizing presence versus absence.15 In the case of iconic images like the siluetas, which persisted in several iterations over the course of many years, the exhibition organizers also undertook to show the shifting forms that those images took over time, which in turn indicated the ways that the political discourse was evolving. The curatorial strategy was also sensitive to the different statuses of the objects presented across the spectrum: from art to politics, from planned to improvised, from art to information, from authored to collective, from public to private spaces, and so on. In view of this, the organizers decided that the display should make continual shifts in scale, density and medium, offering a viewing experience that created a real sense of restlessness. It was a kind of visual corollary to the overall geography of the exhibition content—at once episodic and atomized, comprised of small disturbances that happened sometimes with very little concrete presence, and at the same time there was a kind of buzzing, ongoing continuity that formed a tentative but politically significant sense of common purpose. This is something that might have relevance also in thinking about what might be different in exhibitions wanting to be global in nature—recognizing that art exists differently in different places, has different relations to non-art objects, that sometimes there may be much less distinct or determinate boundaries around it. Perder la forma humana’s organizers were also very tuned in to the affective registers of the works, probably in part because these histories were so personal and vivid for them—and this affected their approach to materializing them in the form of an exhibition. So they thought about the progression of the exhibition’s narrative in almost theatrical ways, attentive to the rhythms they set up between the traumatic works, for instance, and the defiant ones—slowing down the pace of viewing at some moments and speeding up in others, working with contrasts in lighting and sound and, I think maybe most importantly, avoiding any shallow triumphalism about what any of those interventions had actually accomplished. The show’s subject was societies that had been profoundly traumatized, and while the artistic interventions that had been conceived and staged at the time—and then recuperated in the exhibition—provided spaces of possibility, or protagonism, or refusal, the show was being organized some decades on from that time, and acknowledged that its job of reflection also had some mourning work to do. Canonization And finally, I want to go back to what I called the “canonization” issue. Some years ago, art historians in the southern cone were becoming increasingly unhappy with the fact that Tucumán Arde, which was included in Global Conceptualism, had become the obligatory (and often, sole) reference for artistic activism during the 1960s in Latin America.16 Subsequent to Global Conceptualism, it was also included in numerous other exhibitions, including Documenta XII. The historians’ concern was basically that a project that had been a complicated and highly contextual political action had been compressed and truncated into the status of an artwork in order to be translated into an exhibition context. As Miguel López, one of the curators of Perder la forma humana, put it, this created a gradual erosion of its real meanings, part of a “standardization of radical experiences in order that they may establish an appropriate exchange with centralized discourses.”17 In light of this phenomenon, López, Ana Longoni, and some others organized Inventario 1965–1975: Archivo Graciela Carnevale, a show that “introduced itself as a questioning of the process of legitimization and institutionalization of ‘political art.’”18 Maybe the most important thing to signal here with respect to all this is that, as these local histories are gradually incorporated into the ones that are not considered to be minor—minor, that is, in the sense of minor literatures—it’s crucial to keep the historicization of those works in continual dialogue with practitioners on both sides of that divide, because their legitimization and institutionalization keeps raising new sets of questions in both settings. It’s interesting to me that Global Conceptualism has resonated in these two pretty distinct directions—on the one hand global shows, and on the other the recapturing of histories— and that those track to particular preoccupations in different sectors of contemporary arts discourse. In places where there has been extreme insecurity of legacy, loss or evacuation of pertinent histories, and so on, it opened a door for reconsidering certain radical legacies in the context of a present that is mightily interested in those as living heritage. On the other hand, in places that have confidently narrated the histories of their own choosing, it seems that Global Conceptualism might have been useful for its experiment in who gets the rights of authorship. For me, personally, I think the most powerful lesson has been about how intensely it can matter to people, even so many years later, that we took a chance and made an exhibition with so little certainty and so much elasticity—for better and for worse. Maybe that’s the real takeaway: that these accounts of the past are received in such various and unforeseen ways might be, in itself, reason enough to continue devising new ways to tell them, to see what can be sparked in the process. In the fifteen years since the exhibition Global Conceptualism: Points of Origin, 1950s–1980s was on view at the Queens Museum, the term global has become ever more thoroughly entrenched in the lexicon of contemporary art. 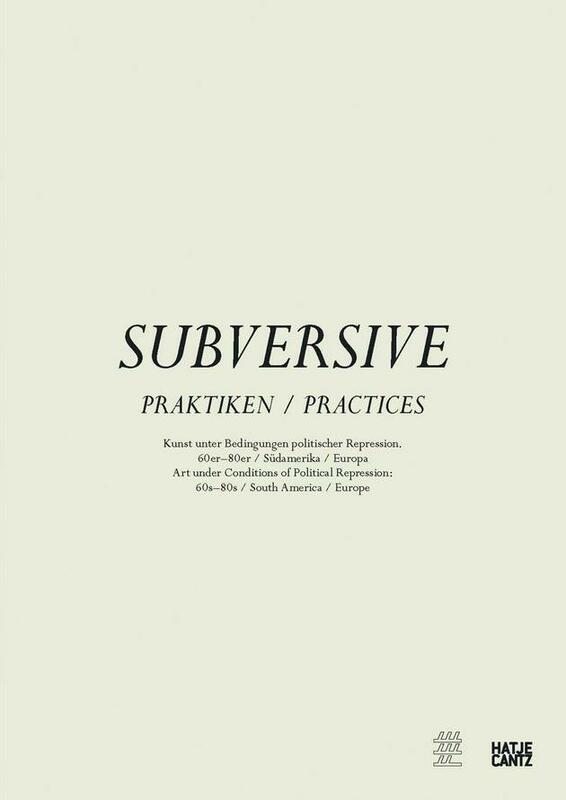 Although one might therefore draw a direct line between the 1999 exhibition and the ever-present “global contemporary” of the art world, texts by two of the exhibition’s curators—Jane Farver and Rachel Weiss—which are published here, underscore an understanding of the global that has little in common with the market-driven associations the term has today. In presenting a pre-1990s regionally defined globalism, Global Conceptualism did not attempt to blur the geographical boundaries despite the fact that a nascent transnationalism was evident in networked art, even in the 1950s. In the last fifteen years, much has changed in the ways that globality is thought about in museums, not least because of rapid changes in communication. As contemporary art traces similar paths to those of transnational financial flows, the emphasis on the global is rendered suspicious because of its deep entanglement with capital. Although neoliberal forces are certainly at play, the impetus for researching art from outside the traditional purview of US institutions must be understood as much more complex, in that it is also an attempt to understand the history of art scenes and movements that are growing ever more connected. Not only an impetus then, but also an imperative. The term conceptualism has also been contested in recent years. If using the label makes available widely disparate works that respond to very different contexts, it is also guilty of flattening out the unique nature of propositions made by artists around the world. What can be learned today from an exhibition such as Global Conceptualism? How can the incommensurability of artworks created in different places be considered productively? Is the “global” exhibition defunct or do new curatorial practices that cast aside curatorial values such as coherence or chronological linearity (as Weiss suggests in her text) need to be developed? What alternatives might be sought to this model of exhibition? This Theme, Global Conceptualism Reconsidered, offers an opportunity to think about these questions. It also offers the chance to reposition some of the materials published by post over the last few years. In addition to the two texts by Jane Farver and Rachel Weiss and an interview with Luis Camnitzer, the project directors, we asked the curators of different sections to reflect on their involvement in the exhibition, and republished here some of the reviews and installation shots of the exhibition. Jane Farver, curator and former Director of Exhibitions at the Queens Museum, was invited to MoMA to speak about the exhibition Global Conceptualism: Points of Origin, 1950s–1980s, which she co-organized in 1999 with Rachel Weiss (who also came to present on the subject), Luis Camnitzer, and an international team of curators: Okwei Enwezor, Reiko Tomii & Chiba Shigeo, Claude Gintz, László Beke, Mari Carmen Ramírez, Peter Wollen, Terry Smith, Margarita Tupitsyn, Sun Wan-Kyung, Gao Minglu and Apinan Poshyananda. Farver and Weiss (whose talk can be accessed here) were invited to reflect on the exhibition—its challenges, failures and successes—fifteen years after it was seen at the Queens Museum in New York. 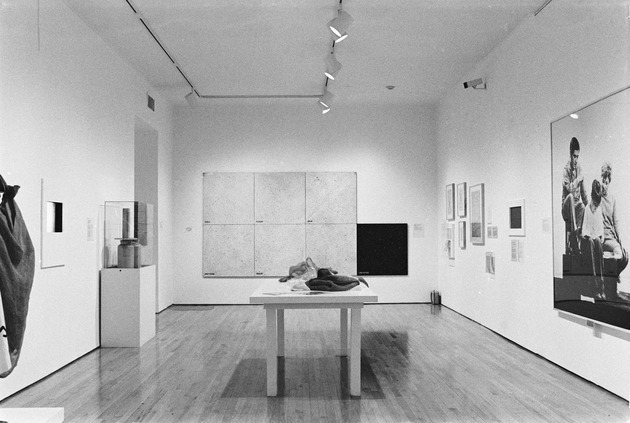 Global Conceptualism: Points of Origin 1950s-1980s was an exhibition that originated at the Queens Museum of Art, New York in 1999, when I was the Director of Exhibitions there. It was on view there from April 28–August 29 and then traveled to the Walker Art Center (December 19, 1999–March 5, 2000), the Miami Art Museum (June 23–August 27, 2000), and the List Visual Arts Center at MIT (October 24–December 31, 2000). As project leaders for the exhibition, Luis Camnitzer, Rachel Weiss, and I worked with a team of 12 international curators representing 11 geographic areas. Global Conceptualism happened 14 years ago, but it continues to elicit strong opinions. However, I hope we are not here to retry this exhibition, but to think about how curators and museums might go about creating exhibitions on a so-called global scale today. For this reason, perhaps some background information about the show might be helpful. As I remember it, the project began sometime in 1994, when Rachel Weiss and Luis Camnitzer invited me to lunch to ask about the possibility of the Queens Museum organizing an exhibition of Latin American conceptualist art. As discussions ensued, it became clear that each of us knew of conceptualist practices that had emerged and flourished in other parts of the world and that were generally unknown or unacknowledged by the New York art world. These movements of course were connected by a complex system of global linkages, but the important fact was that they clearly had been spurred by urgent local conditions and histories. Although an exhibition of Latin American conceptualism was badly needed in New York, we decided instead to organize a broader show that would include conceptualist art from around the world, including North America and Europe. From the beginning we understood the territory of “globalism” as having multiple centers in which local events were crucial determinants. Each of us had our own reasons for wanting to do such an exhibition. When I recently asked Luis to tell me his reasons, he wrote to me that he wanted “to decenter art history into local histories and put the center in its right place as one more provincial province” so that other areas, and particularly Latin America, could, as he says, “do local analysis to help assume local identities that were unmolested by the hegemonic watchtower.” Rachel had a strong desire to demonstrate conceptualism’s political capabilities. I had been frustrated by the repeated presumptions by New York art critics and curators that conceptually based, or experimental, if you will, works by international contemporary artists were simply derivative of Western art. There seemed to be a lack of interest or a disregard for the fact that these artists could well have inherited and were responding to their own important local histories. While New York in the 1990s had seen an influx of contemporary artists from around the world, many of whom were engaged with conceptualist practices, exhibitions of modernism or earlier conceptualism from other parts of the world were still uncommon. Alexandra Monroe’s remarkable 1994 exhibition Scream Against the Sky: Japanese Art after 1945 had sketched out Japanese modern and contemporary art history for audiences in Yokohama, New York, and San Francisco, and there had been a number of exhibitions about Soviet art, including Between Spring and Summer: Soviet Conceptual Art in the Era of Late Communism at Boston’s ICA and The Green Show at Exit Art in 1990, and, in 1991, Perspectives of Conceptualism at the Clock Tower. However, New York had yet to see a museum survey exhibition of conceptualist art from Latin America, Eastern Europe, and many other parts of the world. Information about such work was difficult to obtain, particularly in English, and this void made it easy for New York critics and curators to assume that little that was innovative in conceptualist art was being produced outside of the so-called center. Until then, the most international museum exhibition of Conceptual art ever staged in New York had been Kynaston McShine’s Information, held at MoMA in 1970. The show included works by more than 150 artists from 15 countries, including Argentina, Brazil, and Yugoslavia. I hoped to expand the dialogue around conceptualism, including North American and Western European conceptualism, and to build on what had been presented elsewhere in several earlier exhibitions. When we began to work on Global Conceptualism, the movement already possessed an almost 30-year history. One large survey exhibition of Conceptual art: L’art conceptuel, une perspective had taken place at the Musée d’Art Moderne in Paris in 1989; and the Museum of Contemporary Art in Los Angeles would mount Reconsidering the Object 1965-1975 in 1996. However, neither of these shows included many works by non-Western artists. There was a third important exhibition, Paul Schimmel’s Out of Actions: Between Performance and the Object, 1949-1979, at the Museum of Contemporary Art in Los Angeles in 1998. I will return to this exhibition later. The thought of how to begin to organize all of the material we potentially wanted to include was a daunting one. One strong influence that soon emerged was the work of historian Eric Hobsbawm. His book about the 20th century, Age of Extremes, offered us a way to think about and sort out how conceptualism had developed in different areas according to what Luis called “local clocks.” The last two chapters of Age of Extremes describes two periods of what Hobsbawm called the “Short Century.” He stated that the “Golden Age” of 1947 to 1973 was a period of both political standoff in the Cold War and unprecedented economic growth; whereas he called the years 1973 to 1991 the “Landslide” period, a time when “the world had lost its bearings and slid into instability and crisis.”2 These time periods and events seemed to correspond to when and why artists turned to conceptualist strategies in various places, and we decided to use these demarcations as a loose framework for the exhibition. One strong influence that soon emerged was the work of historian Eric Hobsbawm. His book about the 20th century, Age of Extremes, offered us a way to think about and sort out how conceptualism had developed in different areas. As we began to think about doing such a show, another reason became increasingly compelling for me. The events that Hobsbawm outlined in his “Golden Age” and “Landslide” periods were echoed in the history of the Queens Museum’s building, which had served as a pavilion in two world’s fairs and from 1946 to 1950 had been the home of the General Assembly of the United Nations, where the independence of a number of emerging nations had been recognized. The Queens Museum and other New York City borough museums were created in the early 1970s, when activists advocated for the creation of cultural institutions outside Manhattan. This happened while staggering changes were taking place in many parts of the world. The rise of urbanization, the abandonment of an agricultural way of life, and the proliferation of repressive governments, and radical changes in US immigration laws, attracted millions, to the US and to the Borough of Queens. The histories that were outlined in Global Conceptualism were not abstract to our Queens constituents; they were their histories, and it seemed important to present at least a portion of these histories through art, to the best of our ability. Because we did not want one grand narrative for the show, we wanted to invite a team of international curators to work with us. Since information about artistic production in many parts of the world was hard to access—the Internet and JStor were in their infancies, and Google would not even be incorporated for another three years—we relied on exhibitions we had seen, what we had read, and recommendations from colleagues to put together our team. The geographical demarcations now may seem haphazard, but at the time we were interested in putting forth information about the conceptualist activities of which we were aware, and in inviting curators we knew were working with this subject. The curatorial team would choose 240 works by more than 130 artists to trace three decades of the history of conceptualist art through two relatively distinct waves of activity. The first, from the late 1950s to about 1973, included works from Japan, which were selected by Reiko Tomii and Chiba Shigeo; from Western Europe, selected by Claude Gintz; from Eastern Europe, selected by Lásló Beke; from Latin America, chosen by Mari Carmen Ramírez; from North America, selected by Peter Wollen; and from Australia and New Zealand, chosen by Terry Smith. The second part examined the emergence of conceptualism from the mid-1970s to the end of the ’80s. Margarita Tupitsyn chose artists from the Soviet Union; Okwui Enwezor made the selections from Africa; Wan Kyung Sung from South Korea, and Gao Minglu from China. Stephen Bann wrote the introduction to the catalogue and Apinan Poshyananda contributed an essay on conceptualist activity in Southeast Asia, much of which fell outside the show’s timeline and was not included in the exhibition. Most of our invited curators were obvious choices because of their previous work on the subject. Finding a curator for the Eastern European section proved to be the most difficult. The very term “Eastern Europe” was highly contested, and while a number of curators we talked with were familiar with conceptualist activities not only in their own areas but also in the US and Europe, most could not speak about what had taken place in regions neighboring theirs. 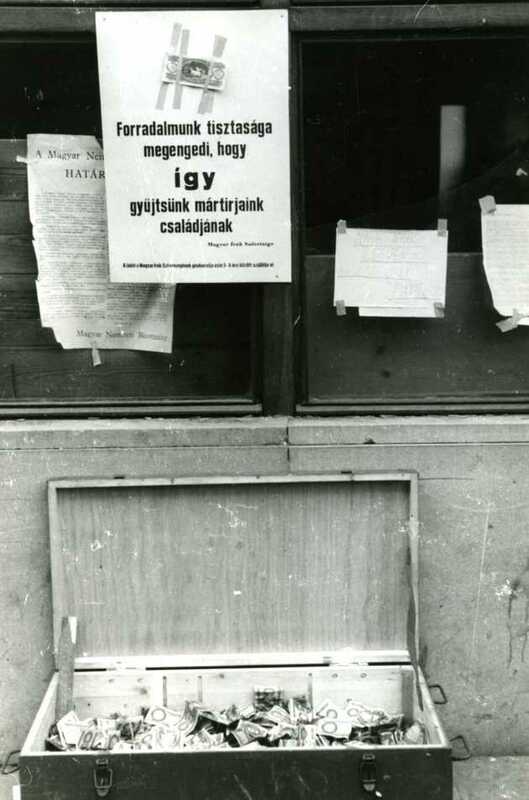 Fortunately, the Hungarian curator Lásló Beke agreed to take on this task. Probably the most controversial invitation was the one extended to the organizer of the North American section. It was offered to Peter Wollen because of a mutual interest in exploring North American Conceptual art in relation to Situationism and activism. I will always be grateful to this remarkable group of curators, and I continue to be amazed by how prescient their work was for the time. The budget for the project was, as we had imagined, very modest, but the Andy Warhol Foundation gave its first-ever planning grant to the Queens Museum to get the project started, and the Rockefeller Foundation provided funds for a meeting of the curators, which took place midway through the project at the Bard Center. It is unfortunate that there were no funds for multiple meetings, or that something like Skype did not exist then, as additional contact would have helped to tease out links and networks among artists in various areas. As it was, the meeting at Bard was fairly successful. It has often been my experience that when curators are exposed to new artists and works, they begin to incorporate them into their own practices, and so we went into the meetings with eleven wildly different shows, and emerged with eleven mildly different shows, but we never really expected all of this to gel into one harmonious vision. The project was plagued by a customs strike that delayed the arrival of works from Latin America until the very day of the opening. Our book editor left us mid-project. Exhibition designer Michael Langley generously helped us determine where to build walls, but we did not have the budget for a full exhibition design, so each curator decided on the placement of works within the spaces they were allotted. I was taken aback recently when I was contacted by a young art historian intending to write a thesis on the exhibition’s layout and design. The show opened to mixed reviews, mostly negative if they were by US critics and better if the critics resided elsewhere. James Meyer criticized us in Artforum for “jumping on the global bandwagon” and for “funding the show through the support of multinational corporations,”4 although, as I mentioned earlier, this was hardly the case. I wish he had simply asked about the budget; I probably would have told him, as there was nothing to hide. A number of critics quibbled with the geographic delineations, which would not have been so apparent in a thematic hanging. And there were many instances in the exhibition where works could have been grouped thematically. Gerhard Richter and Konrad Lueg’s Life with Pop: A Demonstration for Capitalist Realism (1963) might have hung next to Oscar Bony’s 1968 work, La familia obrera (Proletarian Family),9 and been joined by Alberto Greco’s Vivo dito (1962) and Happsoc’s declaration that the inhabitants and buildings of Bratislava were an artwork (1965). Perhaps Akasegawa Genpei’s elaborate 1963-66 Model 1,000-Yen Note Incident and Cildo Meireles’s 1975 rubber-stamped Brazilian currency Who Killed Herzog? might have been placed near Yves Klein’s Sale of a Zone of Immaterial Pictorial Sensibility: Sale to M. Blankfort and Miklos Erdély’s Unguarded Money. These could have been seen as works dealing with money, currency, and value, or artists’ insertions into existing methods of distribution, in which case they could have been joined by works by Eduardo Costa, Antonio Manuel, and Yoko Ono and John Lennon. Tamás Szentjóby and Kendall Geers both employed bricks in their works to very different ends. One could have brought together written paintings by Ono, Leon Ferrari, Willem Boshoff, and Rachid Karaichi. However, it would have been doubly important to provide context for these works, since, for instance, artists working under so many different systems, both socialist and capitalist, may have created works with formal resemblances but with unrelated sources of inspiration, or which considered the public and the private in vastly dissimilar ways. 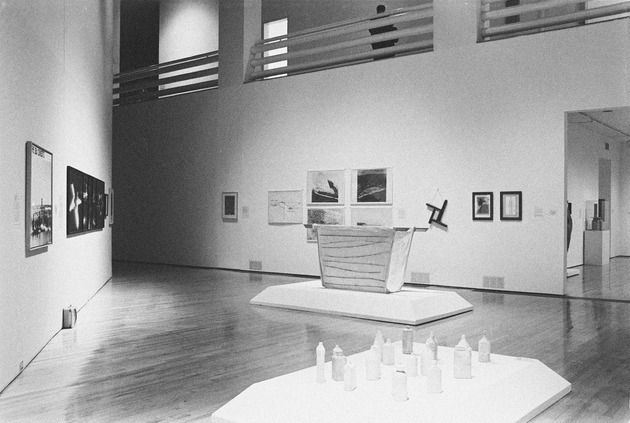 Dematerialization can be inspired by many disparate sources: Buddhism influenced the works of Matsuzawa Yutaka (Independent ’64 Exhibition in the Wilderness, 1964) and Song Dong (Water Diary, 1995, evaporated calligraphy made with brush and water), while North American Conceptual art drew upon the ideas of Duchamp and various Western philosophers. Originally, I had wanted to organize the show thematically and had asked each curator to choose 10 representative objects, hoping for a show that was manageable in size and budget. However, the curators rebelled, feeling it was important to try to present short histories of each region, however imperfectly. Some felt that taking a thematic approach and comparing a few lesser-known, so-called peripheral artists and works with much better-known examples would again privilege the mainstream and fail to provide necessary context. In the end I agreed, and we organized the show geographically and chronologically. Many critics complained about the disparate texts and labels in each section, which was a consequence of the many voices participating in this conversation. Writing them in one soothing museum voice would probably have made it much easier for the viewer but may have taken away the voice of the individual curators. In hindsight, I think it would have been better to have more comprehensive and uniform labels. This is one of my regrets about the show. A problem that was pointed out by a number of critics is one that is inherent in presenting historical Conceptual art. Unavoidably, one makes sacred icons out of art and ephemera that were made for the street. Joan Kee regretted our inability to reproduce the freshness of the immediate gesture through photography, and others thought the show seemed gray, but many of these works had been made under difficult circumstances by artists who had very limited means. We were working with what our curators could find. Katherine Hixson, writing in the New Art Examiner, took the show to task for not making more apparent the fact that conceptualism was, in her opinion, but another futile avant-garde utopian effort.11 However, I think that claim is contradicted even by our choice of images for the catalogue covers. 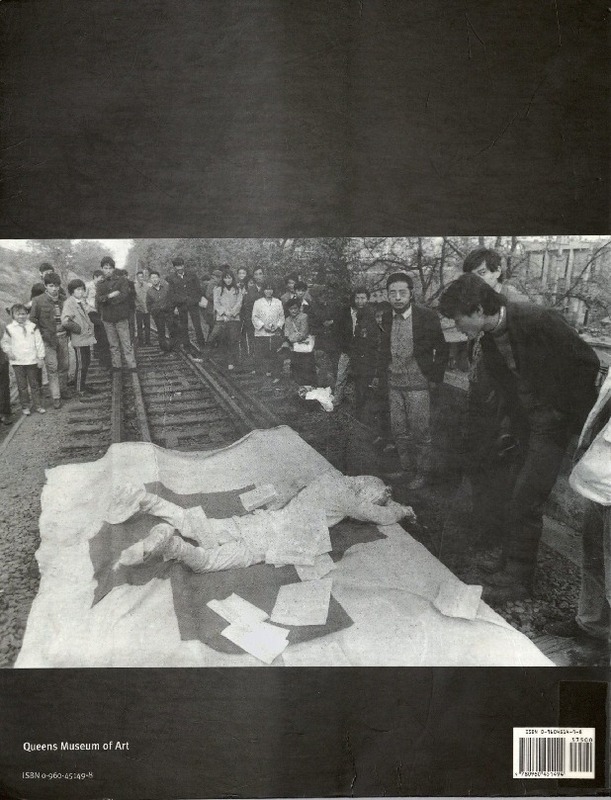 The front cover featured Japanese artist Hikosaka Naoyoshi’s Floor Event of 1970, an optimistic invitation to the Revolution, while depicted on the back was an image from Wei Guangqing’s Suicide Series, which was shown in the China Avant-Garde exhibition in Beijing in February 1989, an event that many now see as anticipating the tragic events that occurred in Tiananmen Square in June of that year. In spite of the scathing reviews the show received when it was on view, it soon began to appear on “best show” lists, beginning with the best shows of 1999 and moving on to the best of the previous five and even 10 years. Such citations appeared in Flash Art _(Michael Cohen); _Bijutsu Techo; Artforum (Dan Cameron); Time Out New York (Tim Griffin); the New York Observer (Marjorie Welish), and others. The exhibition will be included in Jens Hoffman’s soon-to-be-published book Show Time: The 50 Most Influential Exhibitions of Contemporary Art.12 Global Conceptualism has taken on a life of its own. Frankly, I am pleased but puzzled by the attention the show itself continues to receive. My fear is that attention that should be focused on the many remarkable artists and works in the exhibition is being directed to the show itself. However, it is exciting to see that this research has begun to happen at MoMA and beyond. We were asked to address how we would go about creating a show like Global Conceptualism today. If we can assume that there already will have been historical surveys—even abbreviated ones like those in Global Conceptualism—then I would imagine a thematic rather than a geographic hanging. I would still opt out of a grand overall narrative and choose to work with a team to attempt to explicate differences. It would be important to pay keen attention to the artists’ biographies, to where they lived or studied and who they knew, and trace links and networks in a way that we were not able to do in Global Conceptualism. I said that I would return to Out of Actions, the 1998 exhibition organized by Paul Schimmel for LA MOCA in consultation with an international advisory team that included Guy Brett, Hubert Klocker, Shinichiro Osaki, and Kristine Stiles. It included nearly 150 artists and collaboratives from approximately 20 countries in Eastern and Western Europe, the Middle East, Asia, Japan, and North and South America. I regret that I did not actually see this exhibition, because it, like the others mentioned earlier, did not come to New York, and I had no real travel budget at the Queens Museum. Out of Actions was organized primarily in chronological order, placing artists associated with different movements and countries in proximity to one another and thus allowing connections to be drawn among works that in many cases have not previously been viewed as related. I think this might work, although, as I mentioned above, care must be taken not to iron out the differences too smoothly. Educational programs and information would also be of great importance. It is unfortunate that we did not have the means to conduct video interviews with the artists in Global Conceptualism or to do extensive public programs beyond a symposium that we held in conjunction with the New School. Although I am of nearly the same generation as Lucy, I was not there either, but these words seem an apt description of the discourse around this exhibition. In the end, I think it was accomplished by sheer good will on the part of hundreds of artists and a team of 15 curators, project directors, catalogue essayists, and one adventurous museum director, all of whom were not only willing but eager to take part in this important conversation. Two London exhibitions, the Serpentine Gallery’s Indian Highway and Aicon’s Signs Taken for Wonders, are the UK’s most ambitious attempts yet to distil coherence into the chaotic rush of art emerging from the Indian subcontinent. The marriage between the conceptually minded Serpentine and Indian art – whose overriding characteristics are narrative drive, flamboyant figuration and sensuous colour – is interesting because it is so unlikely. Recent memorable Indian installations have been sprawling, direct and often rooted in the animal motifs of folklore: Bharti Kher’s “The Skin Speaks a Language Not Its Own”, a collapsed fibreglass elephant adorned with bindis (female forehead decorations) at Frank Cohen’s Passage to India, or Sudarshan Shetty’s bell-tolling aluminium cast of a pair of cows, now at the Royal Academy’s GSK Contemporary. Nothing like that is in Indian Highway; with conceptual aplomb, the Serpentine turns the accessibility and energy of Indian art into a taut cerebral game. The highway of the title refers both to the literal road of migration and movement, and to the information superhighway, which together are propelling India to modernity. Dayanita Singh’s wallpaper-photographs of Mumbai’s central arteries illuminated at night introduce the theme in the first gallery, and a crowd of sober documentary films worthily continue it – but a pair of installations catch the symbolism best. One is Bose Krishnamachari’s celebrated “Ghost/Transmemoir”, a collection of a hundred tiffin boxes – widely used to convey home-cooked lunches to workers across cities – each inset with LCD monitors, DVD players and headphones, through which everyday Mumbaikars regale audiences with their stories, accompanied by soundtracks evoking the high-pitched jangle and screech of Mumbai street life. The other, towering upwards to the North Gallery’s dome like a beating black heart at the core of the show, is Sheela Gowda’s “Darkroom”, consisting of metal tar-drums stacked or flattened into wrap-around sheets, evoking at once the grandeur of classical colonnades and the ad hoc shacks built by India’s road workers. Inside, the darkness is broken by tiny dots of light through holes punctured in the ceiling like a constellation of stars; yellow-gold paint enhances the lyric undertow in this harsh readymade. Opposite is N S Harsha’s “Reversed Gaze”, a mural depicting a crowd behind a makeshift barricade who tilt out towards us – making us the spectacles at the exhibition. All Indian life is here in this comic whimsy: farmer, businessman, fundamentalist Hindu, anarchist with firebomb, pamphleteer, aristocrat in Nehruvian dress, south Indian in baggy trousers and vest, tourist clutching a miniature Taj Mahal, and an art collector holding a painting signed R Mutt – linking the entire parade to the urinal, signed R Mutt, with which Marcel Duchamp invented conceptual art in 1917. Essential to the meaning of “Reversed Gaze” is that it will be erased when the exhibition closes – a slap in the face for the predatory art market. So will the pink and purple bindi wall painting “The Nemesis of Nations” by Bharti Kher, who recently joined expensive international gallery Hauser and Wirth. And a canvas of drawings greeting visitors as they enter is all that is left of Nikhil Chopra’s performance piece “Yog Raj Chitrakar”, in which the artist this week spent three days assuming the persona of his grandfather, an immaculately dressed gentleman of the Raj, and lived and slept in a tent in Kensington Gardens, entering the gallery only to daub the canvas that stands as an art of aftermath – a memory drawing. Painting here is a vanishing act. Maqbool Fida Husain (aged 93) has made 13 bright poster-style works – red elephants, a tea ceremony after a tiger shooting, a satirical Last Supper with dapper businessman, umbrella, briefcase, body parts – to surround the exterior of the Serpentine. MF Husain is India’s most respected artist; with these billboards, executed in his standard style of forceful black contours, angular lines and bright palette, he returns to his career origins as a painter of cinema advertisements. In the catalogue, curator Ranjit Hoskote argues that “transcultural experience is the only certain basis of contemporary practice” and that “the chimera of auto-Orientalism, with its valorisation of a spurious authenticity to be secured as the guarantee of an embattled local against an overwhelming global, has been swept away”. But Husain, godfather to generations of Indian artists, and indeed every piece in Indian Highway – from feminist painter Nalini Malani’s looping fantasy figures intricately inked on bamboo paper in “Tales of Good and Evil” to Jitish Kallat’s photographic series “Cenotaph (A Deed of Transfer)”, chronicling the demolition of slum dwellings – proves the opposite: however hard a western gallery tries to make Indian art talk a global conceptual language, its local strengths speak louder. Indian art, on this showing, is visually arresting and thoughtful, but nothing here is formally or conceptually innovative, or aesthetically provocative. We thus respond to its distinctive idiom and themes as cultural tourists. This is the context in which Aicon, London’s leading commercial gallery of Indian art, opened last year. Signs Taken as Wonders is a Christmas selling show but is also intelligently structured around the perennial subject of India’s shifting identities, with misrecognition the trope: out-of-focus photographs of buildings and anonymous steel workers in RAQS Collective’s “Misregistration”; deconstruction of stereotypes in Vivek Vilasini’s “Vernacular Chants” prints; the contrast between questioning pose and expression and monumentality in Riyas Komu’s cropped, close-up “Borivali Boy II”. This show complements the Serpentine’s by emphasising the painterly, such as the fragmented textures and touches of surrealism in Husain’s veiled “Women of Yemen”. In particular, the swirling abstract patterns and slabs of twisting colour in Krishnamachari’s “Stretched Bodies” – portraits of disintegration and change that deny the possibility of single truths, and the delicate ink-on-silk drawings of his “Mumbiya” depiction of a typical citizen, which seems to fade into elusiveness as you draw near – add layers to the vision of chaotic, vibrant Mumbai in the artist’s “Ghost” installation at the Serpentine. Krishnamachari describes the average Mumbaikar as “an ocean of anxieties that have arisen from the everyday question of acceptance”. Flitting between these shows, you feel most of all that uneasiness, both in the creation of Indian art and in our uncertain response to it. 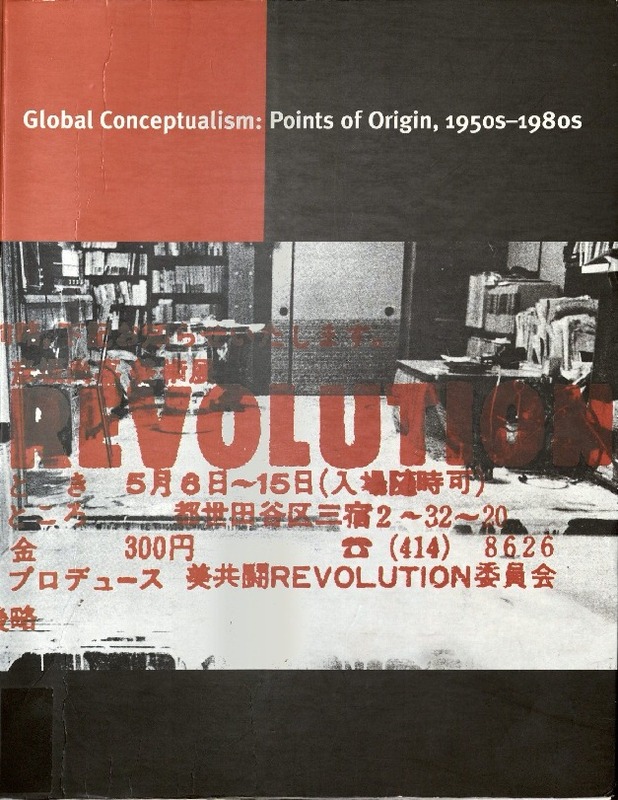 On 28 April 1999 the exhibition ‘Global Conceptualism: Points of Origin, 1950s-1980s’ opened at New York’s Queens Museum of Art. 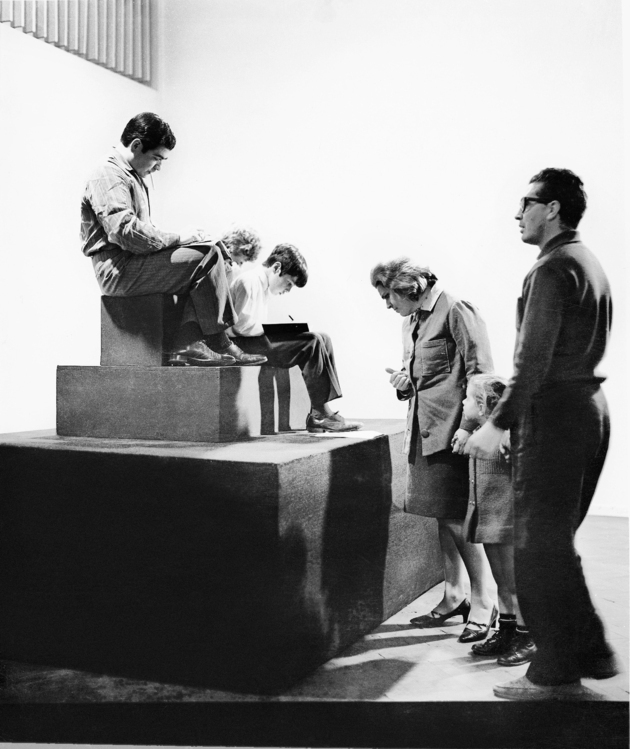 Organised by Luis Camnitzer, Jane Farver and Rachel Weiss, consisting of eleven geographically defined sections and curated by a large, international group of art historians and researchers, the exhibition formulated one of the riskiest and most controversial interpretations of so-called Conceptual art at an international level. The show was ambitious. Its structure created a geographical spill-over that called into question the lesser or secondary place to which certain critical productions had been consigned. The framework of analysis was the global set of social and political transformations that have taken place since 1950, and the emergence of new forms of political action that formed the backdrop to a renewed repertoire of visual language. Such a scope allowed the curators to gather aesthetic proposals not defined in the exhibition by a Conceptualist ‘aesthetics of immateriality’, but instead by their capacity for intervention.2 This approach, without doubt, shifted the very rules according to which the history of Conceptual art had been written. Those radical changes of the modes of producing and giving value to art exposed by ‘Global Conceptualism’ reveal complex processes in which political subjectivities oppose the consensual organisation of power and its distribution of places and roles, mobilising singular and collective resistances and dissenting energies. Ten years on, the shockwaves can still be felt, perhaps even more intensely than at the time. In different ways, ‘Global Conceptualism’ updated some of the debates that had been attempting to raise the issue of subjectivity in social practices from a post-colonial perspective, disputing the geographical and temporal orders of a modern or colonial Occidentalism.3 Hence, it was no surprise that the show became one of the most quoted (and most questioned) referents of the revival of 1960s and 70s critical production that has taken place over the past decade in exhibitions, seminars and publications around the world. While much has been said about the decentralising virtues of ‘Global Conceptualism’, in retrospect its most significant legacy appears not only to be the broadening of the Conceptual art map (a move that had a bearing on several subsequent curatorial projects), but the way in which the exhibition questioned the identity of a Conceptual art with universal aspirations. The curatorial operation of ‘Global Conceptualism’ started from a categorical distinction between ‘Conceptual art’ – understood as a North American and Western European aesthetic development associated with a formalist reduction inherited from abstraction and Minimalism – and ‘Conceptualism’, a term denoting a critical return to an ‘ordering of priorities’ that made visible certain aesthetic processes on a transnational level, allowing for diverse historical, cultural and political narratives to be set in place.4 Conceptualism was presented as a phenomenon that took place in a ‘federation of provinces’, with the ‘traditional hegemonic centre [being] one among many’, drawing a multiplicity of points of origin and questioning the privileged position claimed by Western modernity and its politics of representation.5 The exhibition seemed to work as a performative apparatus determined to re-politicise, reconfigure and rewrite the memory of those decades. As a result Conceptual art, which from the perspective of the United States and Western Europe had until then been an unavoidable prism for reading other critical productions, appeared fractured. The struggle of Latin American historiography to place local episodes within global narratives, in an attempt to counter the dominant geographies of art, has been successful. For some time now, artists such as Hélio Oiticica, León Ferrari, Lygia Clark, Alberto Greco, Luis Camnitzer, Cildo Meireles, Oscar Bony and Artur Barrio, or collective experiences such as ‘Tucumán Arde’ (‘Tucumán Burns’, 1968) and ‘Arte de los medios’ (‘Art of Media’, 1966), have become unavoidable references in virtually all recent accounts that trace the so-called inaugural landmarks of Conceptualism on a transcontinental scale. Today, however, this apparent expansion of discourse seems to demand renewed reflection, as it is no longer a matter of tirelessly continuing to accommodate events in the endless container we believe history to be, but of questioning the ways in which they reappear and the roles they play within it. Such reflection will enable us to examine the anachronisms and discontinuities of historical discourse – its fragments, snippets, shreds – and activate their ability to disrupt once again the logic of the ‘verified facts’. In the recent essay ‘Cartografías Queer’ (2008),7 the theorist Beatriz Preciado discusses the formation of historiographic models of the so-called sexual difference from the perspective of a queer epistemological critique that could be very useful for us in this task. Considering the political scope of the historical exercise, Preciado avoids the taxonomy of places, situations or individuals and instead proposes, in direct dialogue with Félix Guattari’s ‘schizoanalytic cartographies’, a map that gives an account of the technologies of representation and modes of production of subjectivities.8 This map makes explicit how certain dominant diagrams of representation of sexual minorities come dangerously close to becoming mechanisms of social control and discipline. Can we envision a way of reading and representing that does not result in an illustrative exercise of description, but that instead allows for the perception of variations and displacements that appear as forms of subjectivisation, or even as machines of political transformation that disrupt previously established arrangements? But let’s try the opposite exercise too. Let’s imagine a cartography not interested in seeking out the fragments of Conceptual art, one that even doubts the existence of such pieces. Let’s imagine a map that instead aims to explore the label itself, observing its uses and noting how it produces identities in different contexts; a map that, before attempting to function as a technique of representation, tries to expose power relations, ‘the architecture, displacement and spatialisation of power as a technology for the production of subjectivity’.13 Here it would no longer be a question of establishing formal resemblances between works, or of dating those that can effectively guide us in recognising the ‘Conceptual’ or ‘Conceptualist’ category (and its regional derivatives such as ‘Argentinean’, ‘Brazilian’ or ‘Latin American’) but, rather, of finding out how those narratives have determined the materiality and forms of visibility of what they hoped to describe, how they have negotiated their place within and without the institution and distributed it after having transformed these critical art forms into received knowledge. Taking that tension between the cartographic models in their identitarian and queer versions as a starting point, I would like to pose a series of questions concerning some of the recent cartographical representations of Conceptual art: first, by revisiting one of the most influential accounts of so-called Latin American Conceptualism and the re-inscription of the ‘ideological’ as a category from which to consider aesthetic trends in the region; and second, by analysing a recent, almost unnoticed Argentinean exhibition that proposed a strategy for reflecting politically on how it is possible to reassess the ruptures triggered by 1960s avant-garde movements and the ‘Tucumán Arde’ episode. The show, notably, put forward an approach to the archive that refuses to treat this event as a chapter in the history of art and instead reactivates the anachronistic heterogeneity of meanings borne by the documentary remnants. Rather than objecting to the use of the term or any of its related epithets, what I am attempting to do is underline the need to deploy it as a diagram of power, to assess which meanings and distinctions, and which processes of normalisation and resistance are concealed in such consensual representations. This reconsideration demands a different articulation to the other concepts used by critics and artists when considering their own positions: minor expressions (to paraphrase Deleuze and Guattari),27 the gradual erosion of which has contributed to the standardisation of radical experiences in order that they may establish an ‘appropriate’ exchange with centralist discourses. 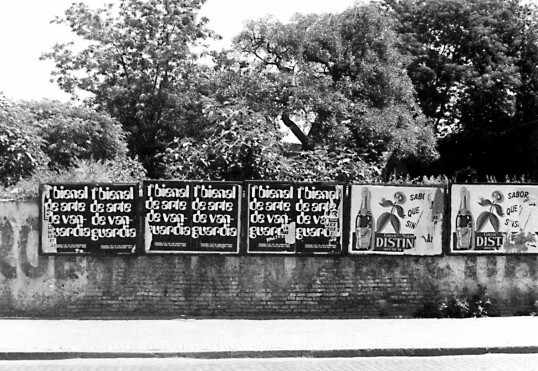 For example, it would be provocative to consider the term ‘dematerialisation’ in the context of Argentina’s experimental art scene in the 1960s as the Argentinean theoretician Oscar Masotta proposed in 1967 – independently from Lucy Lippard – as deriving from El Lissitsky and his plan to integrate artists into the publishing industry of revolutionary Russia of the 1920s.28It also would be challenging to rethink a term such as ‘no-objetualismo‘ (non-object-based art), coined in Mexico by Peruvian critic Juan Acha around 1973, as part of a Marxist approach to counter-cultural protest and collective artistic experiences of the Mexican ‘grupos’ (Proceso Pentagono, Grupo Suma and No-Grupo, among others), but most significantly to indigenous aesthetic processes, such as popular art and design, that question Western art history.29 Or to re-examine concepts that artists employ to reflect on their own practice: Argentinean Ricardo Carreira uses the term ‘deshabituación‘ (‘dishabituation’) to refer to an aesthetic theory based on the political transformation of the environment through estrangement.30 In the early 1960s Alejandro Jodorowsky spoke of ‘efímeros‘ (‘ephemerals’) in reference to his series of improvised and provocative actions confronting conventional theatre, halfway between psychotropic mysticism and fantastic esotericism,31 while Edgardo Antonio Vigo’s ‘revulsive’ aesthetic agenda pledged to destabilise the roles of the artist – on other occasions Vigo defined himself as an ‘un-maker of objects’.32 These are but a few of the entries in the critical repertoire still in the shadow of the hegemonic rhetoric. Such subterranean theoretical constructs pose a latent conflict, a multitude of not-yetarticulated and potential genealogies. Beyond mere naming, these words appear as proof of the fact that there is something irreducible – a discordant crossing of stories that point to divergent ways of living and constructing the contemporary – its capacity to unfold other times. The ‘Inventario’ exhibition tried to re-assess the celebrated entry of ‘Tucumán Arde’ into the canonical historiography of international art,35 as well as its recognition as a foundational episode of Latin American, even global, ‘ideological Conceptualism’ (or ‘the mother of all political works’, as artist and sociologist Roberto Jacoby has ironically called it).36 The project introduced itself as a questioning of the process of legitimisation and institutionalisation of ‘political art’ that in recent years had focused on the 1968 events, in particular on ‘Tucumán Arde’, and resulted in a global tour that took it, among other places, to documenta 12 in Kassel in 2007.37 What is won and what is lost in the process of ‘Tucumán Arde’ becoming a legend? How should we approach the complex and heterogeneous weft of political subjectivities inscribed in the rupture of the Argentinean avant-garde of the 1960s? Is ‘Tucumán Arde’, as a landmark, a watershed moment, capable of giving an account of the most intense and radical moments of that process? The exhibition took the transformation of ‘Tucumán Arde’ into an artwork as its starting point, approached through a selection of photographs and documents from the Carnevale archive in an attempt to visually compose a chronological micro-narrative that would describe the events of 1968. The adoption of this origin not only implied returning to the several narratives in which the Argentinean event had been inscribed over the past decade, but also exploring the documentary framework, the material background from which those reconstructions seemed to appear and disappear. The archive was put forward as capable of disrupting all narrative certainty. The exhibition had four sections, and its focus was on the display of the Carnevale archive, the most comprehensive archive of Argentinean art in the 1960s. The installation made the archive freely available (providing desks and the possibility of consulting and copying documents), enabling the circulation of conflicting accounts coming from other people involved at the time. If the fetishising logic had managed to fix the image of ‘Tucumán Arde’, reducing its complexities to mere forms with seemingly immediate meaning, this exhibition attempted to suggest a totally different cartography based on the analysis of the processes of institutional legibility, their discursive production, exhibition formats, economic transformations and publishing products, uncovering their interrelations and tensions. ‘Inventario’ opened with a long, empty corridor in which beams of light were aimed at the walls and floor. At the end of the tunnel a large number of archival images (many of them photographs taken by the group of artists from Buenos Aires and Rosario in 1968) were projected, accompanied by audio fragments of interviews held in the 1990s with trade unionists, artists and student leaders, protagonists and witnesses of several of the actions.38 The entrance thereby presented an empty architecture that both revealed its own modes of display and suggested the impossibility of establishing a single story, disrupting, implicitly, the idea of the singular official version. A second corridor presented a substantial part of Carnevale’s archive on walls and tables: photographs, posters, catalogues, writings and manifestos of the various Argentinean avant-garde events, alongside graphic work, pictures and other documents of experiences that connected art and politics in other contexts (from silkscreen prints by Taller 4 Rojo in Colombia to posters of the Brigadas Ramona Parra made before or during Salvador Allende’s socialist government in Chile, and others of the Encuentros de Plástica Latinoamericana in Havana). A panel in a third corridor traced the numerous events and exhibitions in which ‘Tucumán Arde’ had been recovered, quoted, exhibited or referenced, including information about the political and economic protocols in place in each institution, and photographs of how it was installed on each occasion. Materials related to the exhibition venue of ‘Inventario’ and the catalogue of the project (a detailed inventory of all the material in Carnevale’s archive) were displayed on several of the tables, where each publication, catalogue and edition referenced in the gallery was made available. Finally, a space presented the contributions of two recent archives generated by Argentinean activist-artists more recently involved in local experiences, posing questions about the different ways of granting visibility to those practices in an exhibition space. The show was constructed as a series of interludes that paradoxically reformulated the collisions that had initially configured the history of the archive. The passage between one space and another acted as a distancing effect that rejected any possible teleology of facts. While the first gallery had seemed to point out the impossibility of a narrative through the random polyphony of voices and images, the third gave an account of an ‘excess of narratives’ on ‘Tucumán Arde’ and on its own construction (historiographic, curatorial, institutional, economic and social) through its recognisable trajectories and the multiple ways in which it was activated.39 Conversely, in the second gallery, the archive appeared as a potential story, an exhibited archive in use that offered its own migratory movements, its excesses and absences, its revolutions to come. By presenting the actual archive, ‘Inventario’ also fell into contradictions: in spite of an attempt to present a multiplicity of times and events, as reflected by the heterogeneous archival material presented in the second tunnel, the inclusion of images of some of the most recognisable actions within ‘Tucumán Arde’ contributed to a repetition of the excessive prominence that ‘Tucumán Arde’ had already been given in written accounts of the late 1960s experiences. The photographs displayed throughout the gallery space, which had been enlarged for previous exhibitions in which they had been shown, provided an imposing presence themselves, at times even offering an unwitting chronology, especially if compared to the assemblage of documents that pointed to the complexity and impossibility of offering full descriptions. And yet, is it possible to escape from this already constructed significance? 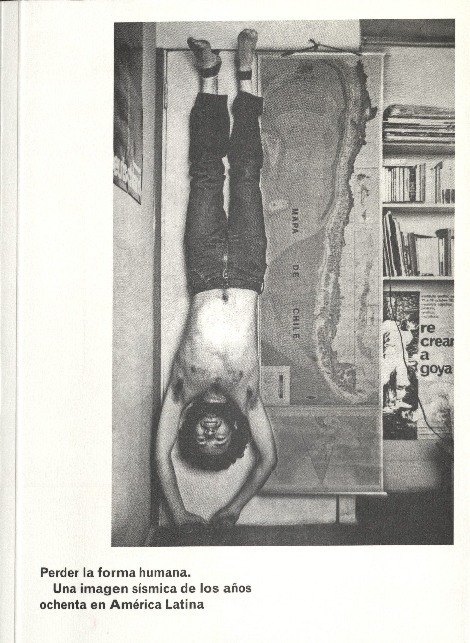 In his most recent book, Luis Camnitzer establishes two key events for the reading of Latin American Conceptualism: the Tupamaro guerrilla group of the late 1960s in Uruguay, and the experience of rupture that led to ‘Tucumán Arde’ in 1968.41 What is important for me here is the invocation of the Argentinean experience in relation to politics from the point of view of militants, or even armed conflict. Despite the possible good intentions behind its attempt to politicise historiographic accounts, we should ask ourselves whether the twosome Tupamaros/’Tucumán Arde’ and the idealised image of ‘resistance’ in which it places the Latin American Conceptual art history implies a pre-established consensus that reaffirms a certain stereotype of subversive art. If that is the case, does this point to a dead end for the politicisation of Conceptualism, and for its criticism? To what extent has an experience such as ‘Inventario’ managed to suggest an alternative representation of the usual story, to fracture narrative certainties or to dispute its stereotyped places? Is it possible to establish a topography of that which cannot yet be named, an index that refuses nomenclatures and stands alone, only to become disorder and pure unpredictability? 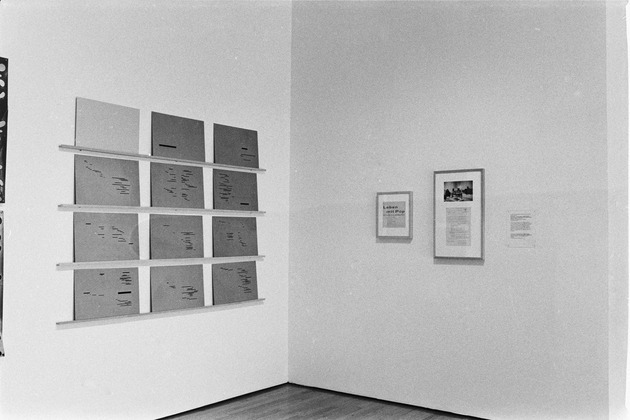 Forty years ago the Argentinean artist Eduardo Costa made a piece in which he proposed a counter-history of Latin American Conceptualism, one based on mixing up the dates: A piece that is essentially the same as a piece made by any of the first conceptual artists, dated two years earlier than the original and signed by somebody else. In this short text, written for the exhibition ‘Art in the Mind’, Costa suggested stealing history as a political activation of Conceptual practice, challenging ‘reasonable’ consolidations by historical narrative – a historiographic practice deliberately formulated around error.43 His work seemed to insist on the possibility of thinking that rationalist history has been permanently mistaken – that there is no possible story, but merely a circumstantial sum of paradoxes, trades and sleights of hand, and that an erratic alteration in its diagram of successions simply adds to its most joyous (in)coherence, celebrating its impossibility. Costa’s work reminds us that history is never neutral, and if there should be any pending task it is precisely to be unfaithful to it, to betray it. This does not mean giving up on historical reflection, but rather corrupting whatever degree of Christian fidelity and Calvinist obedience history still inspires, unravelling its destiny and ultimate causes. Looking back at those events consigned to oblivion should allow us to recover their salutary force, their emancipatory thrill and at the same time to activate a nostalgia for the future. We do not recover the past in order to make it exist as a bundle of skeletons, but to disturb the orders and assurances of the present. The task of reintegrating the subversive component of whatever we happen to be historicising can’t be resolved by communicating as truth what we apparently know. It is neither a question of producing exhibitions or books on a certain theme, nor of drawing up lists, directories or summaries. It is a question of making the event spill over and break down established modes of thinking about the past and the future, and generating ways of allowing for whatever is excluded to eventually challenge the consensus and bring back the parts of an unresolved conflict. April 2000Globalization has stimulated many critical responses in the West. In order to establish ¡°Global Conceptualism¡± in its true sense and to critique Western modernity, especially all forms of universalism, people begin to re-examine concepts including the particular, the local, and difference. In the framework of multiculturalism and global conceptualism, people tend to use post-colonial cultural theory to examine contemporary art and culture in China. This misinterpretation is strategically placed. Chinese art is in a place where unprecedented opportunities and challenges, complexities and paradoxes co-exist. In the world¡¯s rich and diverse cultural landscape, Chinese artists need to be imaginative creators rather than producers of stereotyped and iconic images of the cultural Other. In late April 2000, at the invitation of the China Art Academy, the artistic director of the Documenta XI Okwui Enwezor visited Hangzhou with six renowned curators and critics. Sponsored by the Liang Jiehua Art Foundation, this visit was their first stop in China. This ¡°star¡± curatorial team¡¯s China visit was highly significant. Since 1955, the Documenta has launched ten exhibitions (once every five years) in succession. The Documenta X was under the curatorship of the French Catherine David, whose explicitly Western-centric approach provoked a great deal of criticism in the international art world. As a strategic response to the previous Documenta, Okwui, a curator with Nigerian descent was selected as the artistic director of the Documenta XI. He became the first curator with African descent in the history of the Documenta, probably even in the history of art exhibitions in the West. His appointment signaled the multicultualistic tendency in the international art world. Okwui expounded his art research theme, ¡°Global Conceptualism¡± in the Queens Museum in 1999, which inspired many non-Western artists. In their brief visit to Hangzhou, Okwui and other curators had lively discussions and exchanges with artists and students at the China Art Academy. The three-day discussions highlighted several important issues. What is the West? What do we mean when we use it so often and so casually? It is exactly the question that Okwui raised when he first arrived in Hangzhou. It is also the question being discussed repeatedly throughout the three-day discussions. In fact, this difficult question is deeply rooted in China¡¯s history in the past century. The beginning of China¡¯s modern history is marked by the unforgettable ¡°contacts¡± between China and the West in 1840. The arrival of the Western powers forced China to awaken and to modernize itself. From then on, every issue in China was considered and dealt with in terms of the China-West relations. The notion of the West is laden with complex meanings and feelings. Over the past century, China¡¯s embracing of things Western always went hand in hand with its resistance to the West. China fought against the West while expecting the recognition from the West. This dual relationship between China and the West found its expressions in art; from the beginning, Western art was a constructed notion, as well as a complex and paradoxical ideal and discourse in China. Beginning with the 1979 Star Exhibition, the New Wave Art Movement in China quickly experimented with almost every school/ movement in Western art history. Modern art from the West was received as a mix of certain styles, an established artistic model, or a rebellious way of life. Its reception in China had little to do with China¡¯s rich cultural tradition. Western modern art as a complex whole became a symbol of modernity, and the Chinese artists¡¯ use of Western modern art became an important statement of the intellectual liberation movement in China. In the 1980s, the concept of modernity in China differed significantly from its Western counterpart. It is perceived as a slogan for the revitalization of the Chinese nation. The early 1990s saw paradigm changes in Chinese contemporary art scene, as some critics described, the transitions ¡°from idealism to eclecticism, from ideology to humanistic concerns about individuals and current conditions¡±. This statement might be applied to the field of painting. But in general, this view overlooks an important element in these shifts, that is, the introduction of new media to China. In the 1990s Chinese artists began to discover possibilities of new art forms, such as installation, video, film, and multimedia. On the one hand, contemporary art in China seemed to devote more attention to the current life in China, which often had no direct references to the West. On the other hand, it is important to note that after the 1989 China/Avant-garde Exhibition, Western art institutions and market discovered Chinese contemporary art; Chinese contemporary art was exhibited, collected and studied with growing enthusiasm. This tendency helped the audience to gain more knowledge about Chinese contemporary art, which has emerged as a significant force in the international art community. It is against this background that Okwui and other curators visited China and on their first day in China the question was raised: what does the West mean? What does the West actually mean? Does it mean the hateful Western powers that left painful wounds in our national memories in China¡¯s modern history? Does it mean the scientific and rationalistic spirit that inspired the Chinese when the nation was decaying? Does it mean the dominant powers that looked down upon the Chinese, or the evolutionary ideas and values that have infiltrated into our societal life and ways of thinking in this global village. Indeed, We can find in China¡¯s past and present many complicated and heavy answers to this question. This simple question from the curator with African descent from the most important Western contemporary art exhibition reveals something about the West: Western intellectuals are seriously concerned with the issue of globalization. The notion of globalization has a long history. From the mid-1950s onwards, it became a widely recognized reality, as indicated by the inclusion of the word ¡°globalization¡± by the Webster Dictionary in 1961 and the Oxford dictionary a year later. In the past two to three decades, the advancement of science and technology has resulted in the entry of certain developed nations into the Information and Post-industrial Era. Globalization was further materialized. After the end of the Cold War, transnational have been promoting the idea of establishing a new world order/system. ¡°Globalization¡± became their propagandist catchword. In 1992 the Club of Rome published The First Global Revolution, stating that we are at the initial stage of a new global society. The initial stage of globalization or post-national globalism impacts us in two ways. First, globalization can be seen as a tendency toward economic integration. In view of the world economic imbalance, globalization often means developed nations¡¯ infiltration into developing nations, or Westernization. According to the evolution theory (or the anti-evolution theory at certain points in history), Westernization has become a process in which differences are to be eradicated. George Soros states in the book The Crisis of Global Capitalism that market fundamentalism today is a threat much greater than any forms of authoritarian ideology. Second, in the process of globalization, the Western discourse has received reactions from a variety of forces, primarily forms of cultural resistance from non-Western nations, including indigenization, nationalism, even fundamentalism. Under the influence of those counterforces, the anti-Western-centric discourse such as post-colonialism, Orientalism, multiculturalism came into being within the West. Since the late 1960s, the anti-Western-centric voices have been growing in the West, as the Others intensified their intervention, for example, the African-American Civil Rights Movement and Feminist movements. The West in fact is becoming a cultural sphere with increasing diversity and complexity (In other words, cultural pluralism has undoubtedly become a reality). There has been a de-centralizing tendency in the West where more and more cultural Others are playing an active role. Okwui is one of them. As a curator with African background, he devotes himself to researching and exhibiting African contemporary art. His idea of ¡°global conceptualism¡±, to a large extent, can be viewed as resistance to the kind of ¡°globalism¡± that privileges integration. Except the female American curators Susanne Ghezt and Lynne Cooke, other members in Okwui¡¯s curatorial team came from places outside of what we usually called developed countries or the first world. For example, Sarat Maharai was born and educated in South Africa. Sebastian Lopez is a native of Argentina, currently a Dutch citizen. Chris Dercon is Belgian and Jessica Bradley, British-born Canadian. It seems that the structure of this curatorial team suggests a different West, a pluralistic, non-Western West. Okwui¡¯s notion of ¡°global conceptualism¡± counters the Western-centric discourse of globalization. Global conceptualism has another dimension: non-Western cultures need to be engaged in the dialogues in the global context, as Okwui remarked, ¡°The goal of this Documenta is to build a platform on the foundation of global conceptualism. It is a place where all kinds of cultures can have dialogues, and where we can display a pluralistic scene.¡± For this reason, Okwui placed great emphasis on artists¡¯ identification with their own national cultures as well as the articulation of such identification in their works of art. In his view, this is the way to build a pluralistic scene on this platform. Okwui and his team members were concerned about the Westernizing tendencies in the Chinese art community. After many rounds of discussions on the meaning of the West, Okwui delivered a lecture at the China Art Academy on April 15. He quoted a passage from Alex Harley¡¯s novel Roots, a touching story about the protagonist who traced back his family history back to his ancestor¡¯s African village, where he was treated as an alien. ¡°¡­the seventy-odd other villagers gather closely around me, in a kind of horseshoe pattern, three or four deep all around; had I stuck out my arms, my fingers would have touched the nearest ones on either side. They were all staring at me. The eye just raked me. Their foreheads were furrowed with their very intensity of staring. A kind of visceral surging or a churning sensation started up deep inside me, bewildered, I was wondering what on earth was this¡­then in a little while it was rather as if some fullgale force of realization rolled in on me: Many times in my life I had been among crowds of people, but never where every one was jet black! Roots can be viewed as a modern version of Odyssey against the background of the Western-centric discourse and colonial history. After over three hundred years of drifting in modern culture, the main character Alex H. came back to his land of origin, only finding himself in a worse situation than that of Odysseus, who came back in the disguise of a beggar to avoid being recognized. But Alex H. had no such a choice; he had been altered by the modern culture. When the African villagers surrounded him and watched this ¡°American with black skin¡±, Alex has nothing to say but few words in his ancestor¡¯s language¡­This scene must have created deep resonance in the African-American Okwui. Can we use this touching story as a metaphor for the conditions of Chinese contemporary art? Okwui¡¯s use of the story in Roots reflects the cultural identity of the Other in contemporary Western society. When looking at Chinese contemporary art, Okwui, like other Western scholars, easily fell into a common trap, that is, to use post-colonial theories to analyze and interpret the complex contemporary art and culture scene in China. Chinese contemporary art, especially experimental art, such as new media art, was largely generated in the process of Westernization. But Westernization in China encompasses multilayered, multi-dimensional artistic practices. Whiling adopting new art forms and media in the international art scene, Chinese artists are creating a process of non-Western Westernization, which differs considerably from anti-Western Westernization that one often sees in Africa and Latin America. Anti-Western Westernization is closely related to the tumultuous colonial history in those regions. The central issues in ¡°roots¡± are human rights and racial tension, which have resulted in post-colonialism and indigenization movements. Although China had a difficult semi-colonial history, the inner vitality of the Chinese culture persisted. This vitality is manifested not only in all kinds of anti-modern currents past and present, but also in the fact that from the very beginning, Chinese intellectuals and artists embraced the West with the goal of critiquing and revitalizing Chinese culture. Even the foremost advocators of Westernization like Hu Shi believed that the introduction of Western knowledge to the East will contribute to ¡°China¡¯s Renaissance¡±. Although there have been anti-modern currents such as nationalism and essentialism, China has taken modernization as its major path. Due to the lack of the colonialism-imposed modernization process, China does not embrace resistant-modernity, or fundamentalist ideologies, which are prevalent in many colonized countries. Modernity in China can be defined as ¡°critical modernity¡± rather than ¡°defensive modernity¡±. The essence of this critical modernity is to critique and re-examine China¡¯s indigenous culture, which gives this modernity an intellectual dimension in China. This is also the essence of China¡¯s contemporary culture. Accordingly, the root of tradition plays two roles in our culture; it is no longer a legendary in the past, and Chinese artists are not the people who are fated to return to their native land after drifting in foreign places. In the text above, one can detect certain tension at the initial stage of globalization. On the one hand, it creates a tendency towards integration. On the other, it results in pluralism to certain extent. But only when globalization entered into certain stages, would appear the voice of the Other. These conditions reveal the paradoxical and relative nature of globalization. In the West, globalization has stimulated wide interest in creating a real ¡°global conceptualism¡± by rediscovering the particular, the local, and difference, and by critiquing Western modernity, especially various forms of universalism. Western culture is at a special point of transition from Achille Bonito Oliva¡¯s ¡°cultural nomadism¡± in the 1980s, to the much discussed ¡°identity and the Other¡±, and to various kinds of multiculturalism today. Difference, identity and identity politics have been buzzwords in the international art community. Under the spell of these trendy Western ideas, Chinese theorists (or intellectuals in general) use terms such as post-colonialism, indigenization, Orientalism, etc. with growing enthusiasm. Aware that these terms were created in the West with reference to the third world¡¯s painful colonial history, we need to ask: Is it appropriate to use these terms to analyze Chinese culture? During his stay in Hangzhou, the Indian-British critic, professor of Art History and Theory at Goldsmith College Sarat Maharaj repeatedly raised the critical issue in the international art community: ¡°In the context of globalization, how can we find and establish a common epistemological foundation for the world¡¯s new art in the twenty-first century?¡± This seemingly theoretical question has practical implications. Like the question ¡°What does the West mean?¡± it derives from the notion of ¡°global conceptualism¡±. The answer to Maharaj¡¯s question lies in the story of Roots, as well as in another issue that Maharaj raised, that is, from the perspective of global multiculturalism, the growing exchanges have made it possible to share cultural resources (Small doubt that the shared cultural resources here are exactly what Maharaj described as the epistemological foundation). It is noteworthy that during such exchanges, something must have been repressed. An example is Chinese art in the 1980s, when artists embraced and explored modern art from the West. What is the hidden, silent voice? It is rather clear that the silent voice that Maharaj referred to that of the Chinese indigenous culture, which is often viewed as the Other from the Western perspective. In fact, this kind of voice can often be heard among critics and artists in China. Classic examples are works by those overseas Chinese artists who ingeniously use Chinese signs and political iconographies. In the essentialist and nationalistic criticism of Westerners¡¯ taste for exoticism, we can detect traces of post-colonialism. The issue of identity is critically important in the extremely complex art arena. At the moment when people in the West start to critique their own culture, and when the post Anglo-Saxonism is gaining currency, the identity of the Other (or the identification oneself with the Other) becomes an important issue. The questions that Okwui and Sarat raised are well intended. As the Other in the Western cultural system, they hope that Chinese art (as the Other too) can act as an active participant in the scheme of ¡°global conceptualism¡± that they constructed. Their proposals, however, have two pitfalls. First, if we overemphasize the Other¡¯s differences and its one-sided images, it is possible that global conceptualism and multiculturalism will result in ¡°global cultural imaginaries¡±. The danger is that under such circumstance, pluralism and globalism will not be much different from cultural separatism. This separatism and fundamentalism are two sides of the same coin. It is rather unfortunate that the market¡¯s demand-supply rule plays a prominent role in the artistic production in China. The power of the Western discourse derives from art institutions¡¯ deep pockets, which have attracted or forced many Chinese artists to participate in this massive-scale cultural production in a country with a unique political system. Thanks to China¡¯s economic development and its special status in the international community after the Cold War, this artistic production has become an indispensable resource for the operation of the transnational capital. As part of the global system after the Cold War, China¡¯s politics, folklore, and related artistic and cultural products gain immense popularity on the market as manifestations of China¡¯s Otherness. We must ask: in the system of the global conceptualism, what is the concealed, silent voice in the conception of China? Apparently, Chineseness is a set role on the stage of the global conceptualism. It wears a distorted mask of the Other. This mask is Westernized, and even anti-West. We may even use the term anti-West Western to define it. Chineseness, however, does not lie in its non-Westernness. The time-honored artistic tradition in China was built by innumerable creative geniuses throughout the ages. This tradition is rich and unique. It is true that its uniqueness cannot be seen unless we compare China with other countries. Over the past hundred years, we have established a notion of Chinese art by using the West as our frame of reference. This fixed concept of Chinese art is concealing; China has been referred to as the East as opposite of the West in modern history. Compared to the progressive, dynamic Western civilizations, Chinese civilization was considered static. In contrast to the representational, rational, analytical, and realistic Western art, Chinese art was often seen as abstract, metaphysical, sensory, intuitive, and idealized. In the Post-Cold War and globalization era when Western culture is transforming itself, China¡¯s non-Westernness conceals its true Chineseness. In our attempt to discover the hidden voice, we need to be aware that a nation¡¯s culture is not monophonic whether it says yes or no. It has deeper and richer meanings. As a driving force behind the growth of a nation, it fosters communities. More importantly, it shapes the character and intellect of the community member. The past century witnessed China¡¯s struggle to redefine its culture in turbulent times. Although China attracts growing international attention today, there are potential crises. On the one hand, how can we claim that we are an Eastern power in the international cultural arena if we do not have any towering figures who contribute to the world culture, or if we do not have any epoch-making events or creative cultural forces. On the other hand, Western discourse including globalism takes a keen interest in China¡¯s contemporary art; Chinese art was seen as a mirror in which the West can find its own image, or as an exotic appetizer in the dinner table of the global culture. Even for those artists who are brave enough to look critically at the current craze for Chinese art, they might not be able to resist the temptation of fame and profit. The twentieth century was extremely eventful. China went through upheavals, including the tumultuous Cultural Revolution, numerous struggles against feudal rule and foreign powers. Today China faces issues such as economic integration and globalization. One tendency deserves our attention in this long process: the gradual disintegration of power discourse and the presence of pluralistic discourse. In fact, the characteristics and essence of Chinese art are formed in its struggles against those non-art factors and ideologies imposed on it. An open environment is necessary to encourage exploration, reflection and creativity in China¡¯s cultural circle. This relies on our critique of China¡¯s cultural heritage, as well as our understanding of current cultural conditions and the world¡¯s diverse cultural resources. Under these circumstances, people began to borrow or appropriate artistic vocabulary from other cultures. In my view, a more important question is: how to use those borrowings to deal with Chinese issues and to gain a deeper understanding of Chinese life. This approach requires the above-mentioned epistemological foundation as well as the experience of current cultural life in China. This experience has more to do with the source of artistic production. Culturally speaking, it is the concealed ¡°silent voice¡±. The interaction between Chinese art and the international community has reached its peak in history. As the recent ¡°China boom¡± in the international art world indicates, the amount of world¡¯s attention to China is unprecedented. Chinese art faces both great opportunities and challenges in an extremely complex and paradoxical cultural environment. We are confronted with a critically important question: how to create a healthy, interactive relationship between Chinese art and the international art world? Before we can deal with this question, we must give serious consideration to another question: in the world¡¯s diverse cultural arena how to make a more imaginative and creative Chinese art instead of a specimen of the stereotyped cultural Other? For Chinese artists, the issue of identity is of primary importance. One¡¯s identity is self-explanatory. We never really lose our deeply-rooted Chineseness, which can be viewed not only as history¡¯s long shadow, but also as the our life here and now. Chineseness may also be viewed as a future, an aspiration that nourishes our heart and stimulates our creative mind. 1.It refers to the 1840 Opium War, after which China began to have frequent contacts with Western countries. 2.Some of the quotations in this essay are translated literally based on the Chinese text. 3.Alex Haley. Roots; The Saga of an American Family. (New York: Vanguard Press) 2007, pp.873-874.